This spoiler-free Escape Tales: The Awakening review was made after playing one 3-player game. We were sent a copy of this game by the publisher in exchange for an honest review. What is Escape Tales: The Awakening? 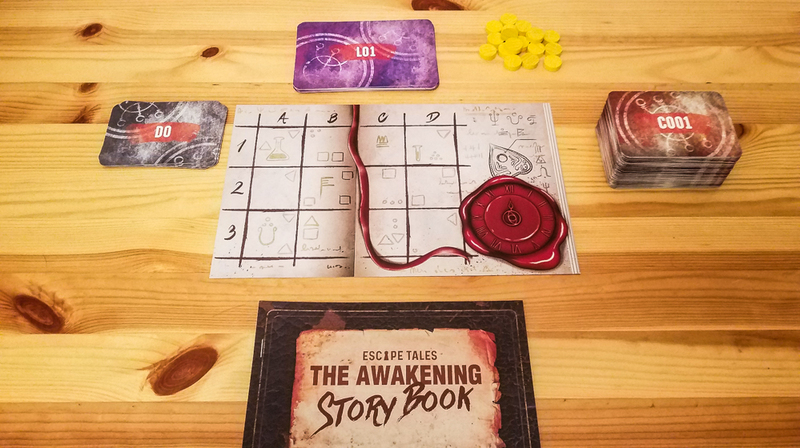 Escape Tales: The Awakening is a cooperative escape room card game in which a father attempts to pull his daughter out of a coma by performing a ritual. The game was designed by Jakub Caban, Matt Dembek, and Bartosz Idzikowski and it is published by Board&Dice. 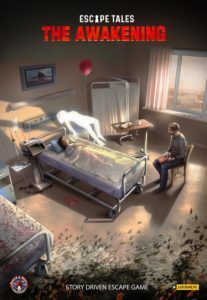 All you know going into Escape Tales: The Awakening is that your daughter is in a coma and that no one seems to know how to help her. Your job is to perform a ritual and find a way to bring her back. Story Book – As you move around and take actions, you’ll read specific paragraphs in the Story Book. Each paragraph will give you updates to the story and will usually tell you to draw cards. Location Cards – To go to a location, you’ll be instructed to place two of these cards on the main board. Each set of cards will have a corresponding map card with 12 boxes that represent the 12 different areas at the locations. The map cards will tell you where you need to go in the Story Book when you take any of those 12 actions. Game Cards – There are puzzles, items, maps, cards that allow you to switch locations, and condition cards that can be only be activated once you’ve fulfilled their requirements. Doom Cards – When you run out of action tokens, you’ll draw one of these cards and resolve it before moving forward. App/Website – There’s no timer in this game, but you will use an app to try to solve puzzles. Each symbol found in the app represents one of the puzzles and you can click on the symbols to see how many cards you’ll need before you can attempt to solve a puzzle. The app also has hints and solutions for each puzzle. Whenever you move to a location, you’ll be told how many action tokens you’ll get. There are usually 12 total areas you can explore at a location, but you won’t start out with that many tokens. It’s important to figure out which areas interest you the most before you commit one of those tokens to the map. What you’re trying to do is solve puzzles so you can move through your ritual and figure out how to save your daughter. Every card, including location cards themselves, can have clues that can help you progress through the story. The game has multiple endings, so your choices really do matter. Annnnnd that’s about all you need to know to play Escape Tales: The Awakening. I’d say more but I don’t want to go into spoiler territory. Check out our Top 5 Cooperative Deduction Games! There’s a really good mix of easy, medium, and tough puzzles in Escape Tales: The Awakening. There definitely are some clever ones in there that will stump most groups. I can’t go into specifics, but I will say that this is an interesting and memorable story. We found ourselves really rooting for this guy in his quest to help his daughter. The action system works well and it brings something new to this game genre. Because you have a limited amount of actions you can take (unless you want some Doom! ), so it forces you to really think about what you want to explore. There is a much better flow to this game than I was expecting. There’s a lot of text to read, but you only have to read little bits at a time. It’s awesome that there are multiple endings to the story. Knowing this ahead of time forces you to care a bit more about every decision you make. Unlike other escape room games, there’s no timer in Escape Tales: The Awakening. This allows you to focus on the story and solving some puzzles. There are only a couple of rules you need to learn before you can start playing. The app is easy to understand and works well. Some of the images on the cards are hard to see. I have decent eyesight and I had to squint hard to see some of the important clues on certain cards. And that was only after getting hints from the app. They say that you can play the game multiple times, but I don’t see too many people wanting to play it more than once. I think most groups will see about 70 percent of the cards and Story Book content in their first play, so even if you take different paths you’ll have to do a lot of the same puzzles. This is a long game. Don’t get me wrong, the strong story and the thinky puzzles make the time fly by, but it still is a 3+ hour game. This is another reason why I don’t see too many people playing this multiple times. Of all of the escape games I’ve played, Escape Tales: The Awakening easily has the best story. More importantly, it has enjoyable puzzles that are challenging without being frustrating. Our game took about three and a half hours and we didn’t take a single break because we were enjoying it so much. It’s oddly addictive; you want to take that next action to read the next paragraph to get more cards so you can solve some puzzles. I do like this game the way it is, but I’d love to see the designers make some shorter ones using the same format. A story-driven escape room game that can be finished in an hour or so would be awesome. If you like escape room games, you absolutely should play Escape Tales: The Awakening. Thanks for taking the time to read our Escape Tales: The Awakening review! To stay updated on all things cooperative board games, follow us on Twitter, Facebook, or via RSS.